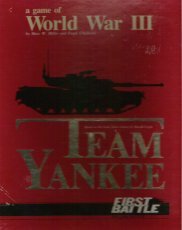 "First Battle series game from GDW. Rules cover the essentials of movement and combat between modern combat units. On this foundation are built special rules covering artillery, morale, chemical warfare, air support, and the other special aspects of modern warfare. The game maps cover the same ground shown in the novel. Eight game scenarios walk you through the rules, unveiling the effects of all the rules, and showing you in detail how to play the game. In the course of playing the scenarios, you will be able to recreate the situations in the book (and perhaps alter their course). The rules chapter on variants lets players change the scenarios to add new rules and replay scenarios to see what effects they will have on the situation. The rules chapter on new scenarios lets players build their own forces and fight out totally new battles." "Korea to the Falklands." 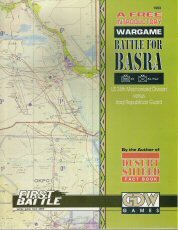 First Battle Series game from GDW. 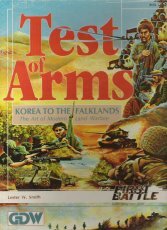 Test of Arms "...covers the many small wars fought throughout the Third World between 1950 and the present which have shaped the present international situation..."
The Korean War; The Vietnam War; The Arab-Israeli Wars; The Iran-Iraq War; India vs. Pakistan; Libya vs. Chad; Ethiopia vs. Somalia; Angola vs. UNITA; The Falklands War; Grenada; Nicaragua." "1945 to 1990 was an era of peace and stability in Europe. NATO in the West and the Warsaw Pact in the East imposed the longest peace since the end of the Napoleonic Wars. But as the Cold War ends, this armed stability will end as well. The nations of Europe have many long-standing territorial disputes and historic animosities that only now can erupt into violence. For years, Romania and Hungary couid put aside their differences in the face of a greater threat from NATO. Greece and Turkey stood uncomfortably together against the potential threat of the Warsaw Pact. Now, the age of unsteady friends has passed. Battlefield : Europe explores potential European flashpoints. Each could turn violent at any time in the next 10 years. 15 Scenarios: * Czechs vs Slovak separatists. * Albanians vs Yugoslavians. * Germans vs Poles. * Belgians vs Walloons. * Belgians vs French. * French vs Dutch. * Russians vs Central Asians. * Romanians vs Hungarians. * Turks vs Bulgarians. * Greeks against Turks. * Greek Cypriots vs British. * Soviet attacks against Turkey. * US vs Soviets in Turkey." Game Components: * Four 11 x 17 game maps of European terrain. * 700 die-cut counters of combat troops and fighting vehicles. * Basic 4-page rules book (all you need for the first three scenarios). * Battle Manual with background, situations, and histories of the wars of the decade, as well as advanced rules. * Two scenario books (one for each side.) * Battle charts. * Ten-sided Die. 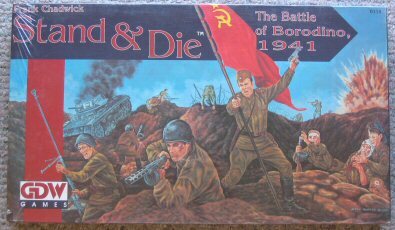 "GAME SYSTEM: Stand & Die is a big game. It has to be to deliver the sweep and scale of this decisive battle. But it plays quickly, enabling tactical situations to develop rapidly, keeping the tension level high. The game system is well developed, well explained, and easy to remember, because it makes intuitive sense. This enables players to be commanders, not just rules lawyers. UNIT DIFFERENTIATION: The system is capable of subtle and sophisticated differentiation between units. This is especially apparent in the tanks. Virtually every type of tank available in 1941 on both sides was present at Borodino. The Soviets, for example, have everything from big T-34s down to tiny T-38 amphibious recon tanks. In addition, the strengths and weaknesses of the different infantry and artillery units are well illustrated. FLUID ACTION: Both sides committed a high proportion of mobile forces to the battle. In fact, all of the German troops present were either armored or motorized troops, while the Soviets threw in three of the five tank brigades available to the whole Western Front. The result is lots of movement and rapidly changing tactical situations. FURIOUS AIR BATTLES: While the Germans maintained air superiority in most places, the Soviets knew the defense of the main highway to Moscow was the critical blocking battle and so committed many of their operational aircraft. Both sides had about 300 combat aircraft in the battle, and the game shows the strengths and weaknesses of both sides' various planes. A unique mission card system takes administrative worries out of the players' hands, but puts tactical aircraft right on the game map. HISTORICAL ACCURACY: Carefully researched from German and Soviet sources which have never been published in the West, Stand & Die is an accurate and realistic treatment of this decisive battle. * Four Full-Color Counter Sheets: Over large (5/8-inch) counters represent all of the historic ground and air forces deployed in the battle. * Two Large Mounted Maps: Both maps are 19x28 inches and portray the battlefield in startling detail, researched from Soviet and German military maps. Each large hex (one inch across) represents 500 meters of actual terrain. * Complete Game Charts: All combat, terrain, and movement tables are on one chart, for easy reference. Two copies are included, one for each player. The four game setup and reinforcement charts are in full color to make location of the correct units easy. * 16 Aircraft Mission Cards: These specify the number and type of aircraft committed to the battle. * Status Pad: To record losses and morale, a pad of preprinted status forms is included. * Rules Book: In addition to the game rules, the book includes three smaller starting scenarios andextensive background on the two armies which fought the battle, including organizational diagrams and most detailed battle history ever published in English." * 16 5-color maps (11"xl7" each). * 5 die-cut counter sheets, with a total of 880 counters and markers. * 8-page Jump-Start rules folder with 2 introductory scenarios. * 80-page game manual, including basic and advanced rules, historical notes, and 31 scenarios. "The entry of Italy into World War II on the side of the Axis brought war to North Africa and the Middle East, and that region has seen almost continual warfare ever since. Many, but by no means all, of these wars have been between the Israelis and their Arab neighbors. Others have been between rival Arab states have involved powers from outside the region. These wars have been among the only major conventional ground conflicts since World War II, and thus provide a developing record of the changing nature of weapons systems, tactics, and the intensity of combat. Now, all of these conflicts are explored in one game: The Sands of War. A subject this big requires a game to match, and The Sands of War is loaded with components. Sixteen geomorphic maps and more than 800 unit counters and markers allow recreation of dozens of historic battles. The battle manual provides rules for all aspects of modern combat: antitank missiles, advanced armor, helicopters, fighter-bombers, command control, morale, night actions (and the special equipment needed to fight in limited visibility), chemical warfare, and more. More than 30 historical sceanrios are included, each based on a genuine battle and provided with accurate orders of battle and historical notes. The game itself is meticulously researched, and provides as accurate a view of warfare in the desert as has yet appeared. 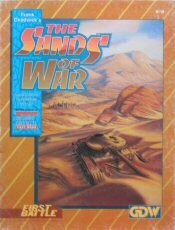 But The Sands of War is also one of the most accessible tactical games ever published. The Jump-Start rules folder provides all of the basic game mechanics neuded for ground combat, along with two scenarios that can be played within a half hour of opening the box. While concentrating on historical scenarios. The Sands of War allows portrayal of every aspect of modern ground combat and rating of equipment, on a common scale, ranging from the British infantry tanks of 1941 to the M1A1 Improved Production tank of 1991. Design-your-own scenario rules enable players to purchase units and match them against hypothetical opponents. Given the variety of maps and unit counters provided, the possibilities are nearly endless." 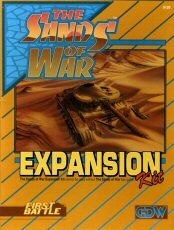 Expansion set for "Sands of War" wargame includes new units, more scenarios, campaign rules, and new maps. It cannot be played without "Sands of War" box set. 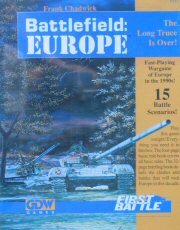 GDW released this introductory scenario to its First Battle wargame system in 1991. It is self-contained, and playable alone.